I adore Rachael Ray, and not even in the guilty pleasure way that I love "Party in the USA." Yes, she is completely overexposed (Rachael Ray bedding, anyone? ), but "30 Minute Meals" is still one of my favorite cooking shows. Many of the quirks that put people off; her use of nicknames, her over the top facial expressions, the somewhat maniacal giggle are, to me, quite endearing. Plus, more importantly, I have tried many of her recipes and I have yet to find a dud (I can't say the same thing to you, Tyler Florence!). While I am certainly not alone in my Rachael Ray appreciation (there is a reason that the woman is practically an empire), in much of the food blogosphere she is treated as an object of scorn. The amount of hatred that is aimed at her is absolutely staggering. To be honest with you, I can understand some of the criticisms. There is the aforementioned overexposure, and the fact that most of her "30 Minute Meals" are more like 45 or 60 minute meals, but people act like she is the culinary antichrist (I think that that title has been taken), and I just don't get it. For the most part I ignore all of the internet ire (much like I ignore the Rachael Ray talk show - hey, I said I like her, not that she could do no wrong), but I saw something recently that irked me. A blogger was writing about quick meals, and she said something along the lines of, "Unlike Rachael Ray I can make meals in 30 minutes without using all processed foods." I thought that was quite ironic, seeing that the whole point of "30 Minute Meals" is to prepare quick meals with fresh ingredients instead of resorting to frozen dinners or boxes of Hamburger Helper. I couldn't help but think that not only had this blogger completely missed the point, she probably hadn't actually looked at too many of Rachael's recipes. The reason why I found that comment so irritating, and why I will probably always be Team Rachael, is that "30 Minute Meals" inspired me to change the way that I cook. Before I started watching her show macaroni and cheese always came from a box, spaghetti sauce came from a jar, and fish always came from the frozen foods section (in suspicious breaded stick shapes). This is going to sound absolutely crazy to people that were foodies from birth, but before I started watching the Food Network, and more specifically Rachael Ray, I had never used fresh herbs, never tasted fennel or arugula or escarole, never even purchased a bulb of garlic. So while it would be an exaggeration to credit my entire cooking renaissance to "30 Minute Meals," it definitely played a role in giving me the confidence to really get in the kitchen and try new things. Even now that Rachael is no longer my first resource when looking for a recipe, I still prepare dishes from the show and her magazine, "Everyday with Rachael Ray." This magazine has a great variety of recipes and some nice, bright food photography. I was immediately drawn to this linguine with goat cheese and fresh tomatoes when I saw it in the June/July issue. The pasta looked beautiful in the picture, colorful and perfectly summery with its profusion of herbs and multicolored heirloom tomatoes, and, if you read my blog, you are already aware of my deep love of goat cheese. This recipe has taken me a long time to write up, but it was delicious, easy, and representative of what I love about Rachael Ray's recipes. This is a dish that takes something very accessible, pasta with tomatoes, and adds some things that an average home cook (right here!) may not have tried. 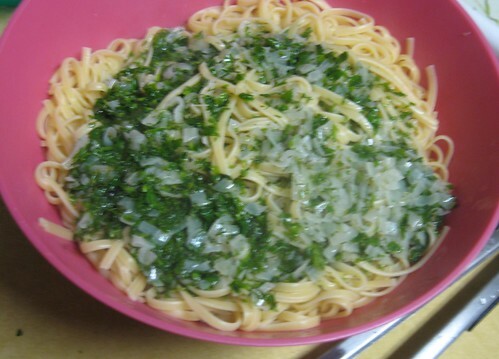 Now I know that goat cheese is delicious with pasta and that fresh tarragon really does have a licorice flavor, and I would like to find dishes that can showcase that. So while this dish may not be the pinnacle of gourmet cuisine, it tastes great, and it captures the flavors of summer, just in case you are not quite ready to let go. A note about this recipe: While this tastes great as written, I think that 6 tablespoons of butter is more than necessary. 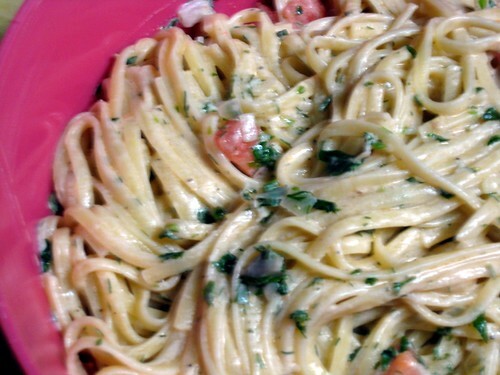 Next time I make this I am going to use 2 or 3 tablespoons; I think that the pasta will still be rich and creamy, and the herb flavor will really sing. Bring a large pot of water to a boil, salt it, add the pasta and cook until al dente. Drain, reserving a ladleful of the pasta cooking water. While the pasta, in a serving bowl, add the crumbled goat cheese. In a medium saucepan, melt the butter over medium-low heat. Add the shallots and cook until softened, about 5 minutes. Stir in the white wine and cook until slightly reduced, about 2 minutes. Add the parsley, dill, tarragon, and thyme. Stir in the reserved pasta cooking water. Add the pasta to the goat cheese. Pour the herb sauce on top, season with pepper, and toss 1 minute. 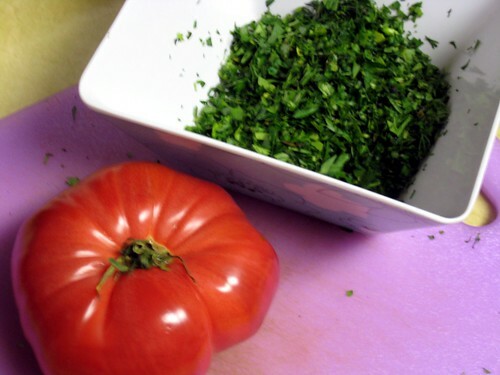 Add the tomatoes and toss gently for another minute; season with salt and pepper.